“They should drop the discredited Mueller Witch Hunt now!” Trump wrote on Twitter on July 23. 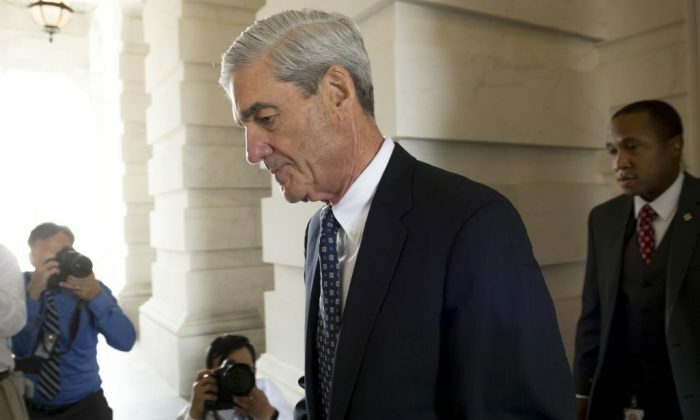 Mueller, formerly director of the FBI, was appointed special counsel in May 2017 to continue the FBI’s investigation into alleged Russian meddling in the 2016 elections, after Trump fired FBI Director James Comey. Declassified surveillance records, however, show that the FBI’s investigation was tainted with political bias. The documents reveal that the FBI, in its application for a FISA (Foreign Intelligence Surveillance Act) warrant on Trump campaign volunteer Carter Page, knowingly relied on information that was paid for and ordered by the Clinton campaign and the Democratic National Committee (DNC). The FBI left the court in the dark about the origins of the information, failing to mention that it came from a political opponent. The information used by the FBI as the core of its FISA application came from former British spy Christopher Steele, who had been hired by Fusion GPS, a firm hired by the Clinton campaign and the DNC through the law firm Perkins Coie. The “Steele dossier” is a series of memos produced by Steele that relies almost exclusively on Kremlin-linked sources. The claims contained in the dossier have not been corroborated. Despite admitting under oath that the FBI’s assessment of the dossier was that it was “salacious and unverified,” Comey himself signed off on the FISA warrant. FISA warrants allow for highly intrusive spying, including on all digital communications, such as emails and telephone conversations, as well as access to bank records and other personal information. They also allow for the use of wiretaps and other recording devices. The warrants can also be used for retroactive surveillance, meaning that communications captured by the National Security Agency under Section 702, which includes nearly all digital communications, can be accessed. While the FISA warrant was obtained on Page, it is highly likely the FBI used the warrant to spy on other members of the Trump campaign, including Trump and his family members. Under the so-called “two-hop rule,” FISA warrants allow for spying on individuals within two degrees of separation from the original target. This means that anyone in contact with Page, and anyone in contact with them, could have been surveilled. It is unclear how the FBI used the information it obtained by spying on the Trump campaign and whether the information was distributed improperly. The FBI, however, has had problems with its handling of Americans’ communications obtained under the FISA. A declassified top-secret report by the Foreign Intelligence Surveillance Court, released in April 2017, revealed systematic abuse by the FBI in handling sensitive data. According to the report, the FBI had provided access to raw 702 data obtained under the FISA to private contractors in violation of procedures intended to safeguard the data. In some cases, the contractors maintained access to the 702 data even after their work for the FBI concluded. The Department of Justice inspector general (IG) found a strong anti-Trump bias among some of the key people involved in the FBI’s investigation, and later the Mueller investigation. Text messages obtained by the IG showed that FBI agent Peter Strzok, the lead agent on the counterintelligence investigation into alleged Russian interference, told high-ranking FBI lawyer Lisa Page that they would stop Trump from becoming president. “[Trump’s] not ever going to become president, right? Right? !” Page texted Strzok in August 2016. Both Page and Strzok went on to become part of Mueller’s investigation. Strzok was fired by Mueller’s team after the IG discovered more than 10,000 text messages sent between Strzok and Page showing a bias in favor of Clinton and against Trump. Two weeks before Strzok’s firing, Page left Mueller’s team. To date, no evidence to support the claim that the Trump campaign colluded with Russia during the 2016 presidential elections has surfaced. An investigation by the House intelligence committee concluded in April this year that there was no evidence to support the claims of collusion. Indictments issued by Mueller so far have either been for crimes unrelated to the election campaign, as in the case of former Trump campaign manager Paul Manafort, who was charged for money laundering that predated the Trump campaign, or related to Russian nationals who allegedly used social media or hacking to interfere with the elections. Deputy Attorney Rod Rosenstein said that no Americans were knowingly communicating with the Russian nationals. Mueller’s team reportedly informed Trump’s lawyers in March that the president is not a criminal target in the Russia investigation.